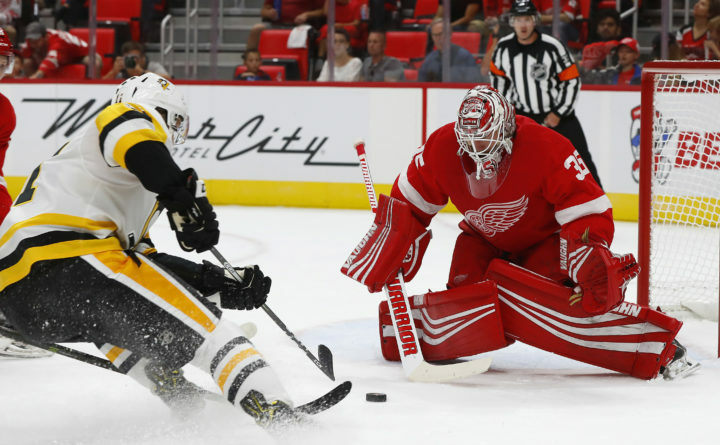 Detroit Red Wings goalie Jimmy Howard (35) stops a shot by Pittsburgh Penguins center Jay McClement (11) during the first period of a preseason NHL hockey game Monday, Sept. 25, 2017, in Detroit. 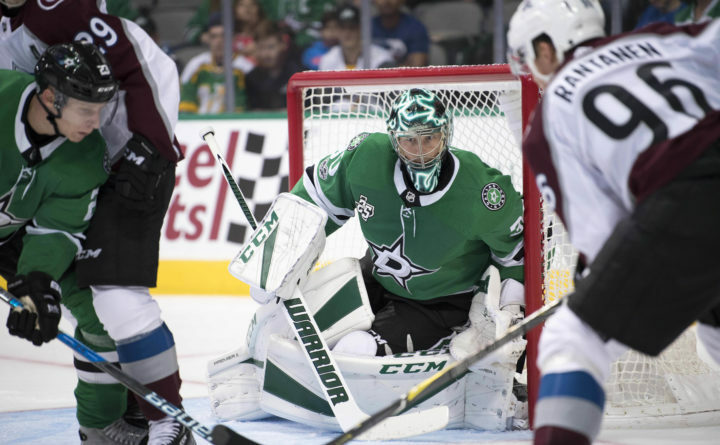 Dallas Stars goalie Ben Bishop (30) defends the goal against Colorado Avalanche right wing Mikko Rantanen (96) during the second period at the American Airlines Center on Sept. 25. Ben Bishop is playing for his third National Hockey League team in nine months, but the former University of Maine goalie doesn’t mind. Bishop was traded by Tampa Bay to Los Angeles in February and the Kings turned around in May and dealt him to Dallas. He was going to become an unrestricted free agent on July 1. Dallas, which signed him to a six-year, $29.5 million contract, opens the season on Friday night against the first-year Las Vegas franchise. Bishop said he was happy with the contract and that Dallas was one of three teams that he considered. “Dallas was always at the top of the list,” said Bishop, who has a career record of 148-80-25 with a 2.32 goals-against average and a .919 save percentage. “It has been a little crazy but I’m not complaining. They have all been good places to play,” said the 30-year-old Bishop. He feels good and is hoping to play well and lead the Stars into the playoffs. The other Dallas goalie is veteran Kari Lehtonen, who has played 612 career games in the NHL. Another one of Bishop’s teammates is former UMaine All-American Devin Shore, who is in his second full season with the Stars. Another former Black Bears standout, center Brian Flynn, is also part of the organization but was recently sent down to the Texas Stars of the American Hockey League. Flynn, 29, played 51 games for the Montreal Canadiens last season, notching six goals and four assists. The 23-year-old Shore had 13 goals and 20 assists in 82 games last season. Bishop was 16-12-3 with a 2.55 GAA and a .911 save percentage for Tampa Bay last season before going 2-3-2 with a 2.49 GAA and a .900 save percentage with the Kings. Two seasons ago, he was second in the voting for the Vezina Trophy awarded to the league’s best goaltender. He was 35-21-4 with a 2.06 GAA and a .926 save percentage for Tampa Bay. Bishop is one of three former UMaine goalies in the NHL. Jimmy Howard, 33, is back with Detroit, coming off a bounceback year during which he posted personal bests in GAA (2.10) and save percentage (.927). However, injuries limited him to 26 games. He is one win away from 200 (199-124-54) and owns a career GAA of 2.43 and a save percentage of .915. And former Chicago Blackhawks backup goalie Scott Darling will get an opportunity to be a No. 1 goalie as he signed a four-year, $16.6 million deal with the Carolina Hurricanes. The 28-year-old Darling was 18-5-5 with a 2.38 GAA and a .924 save percentage last season while backing up Corey Crawford. “Maine has to be the only program with three goalies in the NHL. A lot of credit goes to Grant and Tim,” said Bishop referring to former UMaine assistant Grant Standbrook and head coach Tim Whitehead. Two other former UMaine All-Americans, Detroit Red Wings right winger Gustav Nyquist and Vancouver Canucks defenseman Ben Hutton, will make their season debuts this weekend. The Red Wings host Minnesota on Thursday while Vancouver entertains Edmonton on Saturday. Carolina plays host to Minnesota on Saturday. Nyquist, 28, was Detroit’s No. 2 scorer a year ago with 12 goals and 36 assists in 76 games. He looks to boost his goal scoring after averaging 24 goals the previous three seasons. Former UMaine defenseman Dan Renouf also is with Detroit but will start the season in Grand Rapids (AHL). The 24-year-old Hutton had five goals and 14 assists in 71 games for Vancouver. In the coaching ranks, former UMaine winger John Tortorella returns as the head coach of the Columbus Blue Jackets after winning the Jack Adams Award as the league’s coach of the year. He led Columbus to its best season in franchise history (50-24-8) and became only the sixth coach in NHL history to win the award twice. He also won it with Tampa Bay during its Stanley Cup-winning 2003-2004 season. Former Black Bears goalie Garth Snow is back as the general manager, alternate governor and president of the New York Islanders. Former UMaine assistant and interim head coach Greg Cronin is an assistant with the Islanders. Former UMaine All-American defenseman and New York Islanders head coach Jack Capuano is an assistant with the Florida Panthers and ex-UMaine defenseman Dave Nonis is a consultant to the general manager of the Anaheim Ducks. Nonis previously was the GM at Vancouver and Toronto.